Or: Quick and Dirty Pattern-Draping for Fun and Profit! If you're even a neophyte home sewer, you've probably dreamed of making clothing from your own customized patterns. Commercial patterns are fantastic in many ways — the sheer variety always makes flipping through a pattern book (or browsing vintage reproductions online) inspiring. But commercial patterns have drawbacks, too. They have standardized fits, and sometimes you have to make so many adjustments to them you wonder if it wouldn't be easier just to make your own. And what if you have an awesome idea for a piece of clothing that doesn't exist in any commercial pattern? What then? Making a pattern is your only option. I am a nearly totally autodidact do-it-yourself-er; the methods I relay in this tutorial may or may not be what they teach in fashion school. But they work. So I'm patchy and self-taught, but you know what: that just proves that this kind of stuff is not beyond anyone's reach. It's not that hard. To me, D.I.Y. is about self-sufficiency and, frankly, taking the means of production back from entrenched interests who would rather keep you buying things than making them. Making things is powerful. And it saves money. Being able to draft your own patterns, to be honest, feels pretty incredible. When you have these skills, no design is off limits. To demonstrate basic pattern-drafting, I made a simple, A-line summer sundress with one stand-out design feature: a geometric cut-out on the back. This is really not my own design. I seem to recall having seen a dress very much like this in, I think, an Yves Saint Laurent ad from the Tom Ford era, maybe in 2001 or 2002; I have a pretty vivid memory of an ad campaign with two models, one wearing the dress in black and the other in white. The model in black was, I think, just starting to unzip the model in white. (I can't find any trace of this ad anywhere online — I know because it's one of those Internet rabbit holes I go down every so often.) How similar my minidress is to the one I've been seeing in my mind's eye for a decade (was it even YSL?) I can't really say, but nor can I take sole responsibility for the design idea itself. I'm telling you this to attempt to give credit where it's due. This dress made for a great example to explore basic pattern drafting because it is relatively simple, but unlike any readily available commercial pattern I've ever seen. Obviously, even though I happen to be drafting a dress, this tutorial shows you the skills necessary to draft a pattern for whatever kind of garment you want. This tutorial is intended for relatively experienced home sewers who are familiar with basic construction methods — I'm talking about techniques like basting, fitting a muslin, and setting a zipper. If you're not an experienced home sewer, fear not: reading this, you can still learn a bit about the wide creative world that awaits you once you have those sewing skills down. As always, let the scope of your ambition be your guide. 1. A dress form (mine is a custom body double — here's how I made it last year. It wasn't that hard and it's been holding up great). Before I got my dress form, I drafted a lot of patterns by dressing in polypropylene long underwear and pinning pieces of muslin to myself in front of the mirror — like I said, quick-and-dirty autodidact here. 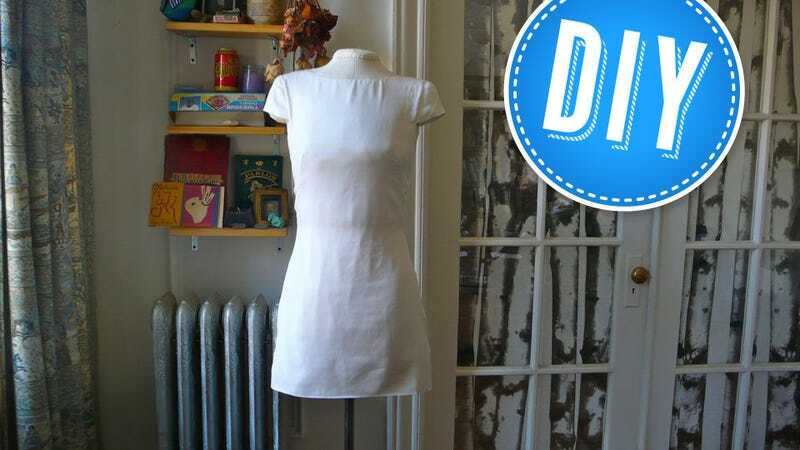 I don't exactly recommend that method, because it's truly tedious and using a dress form is much faster and easier, but if you don't have a dress form and you want to give it a shot, the skills outlined here will get you going. 7. Muslin or other cheap fabric (fabric store off-cuts can sometimes be cheaper than muslin itself — look around) for pattern-drafting. 8. Fashion fabric, for the dress. 13. A ruler, preferably a clear, wide plastic ruler marked with a 1" grid. A set of French curves is, in my opinion, optional (and not used here). Click any photo to enlarge. First up, sketch the dress you want to make. Start with a general idea of length and line (will the skirt be A-line or slim-fitting? Sleeves or no? How do you want the neckline?) and then refine your sketch progressively, until you have considered every design element. You need to define the dart and zipper placement, the kind of sleeve you'll be making, etc. This sketch will be your blueprint. Use the diagrams that come with commercial patterns as a guide. Think about the kind of fabric you want to use — in my case, I found a nice woven cotton/silk blend for $14/yard. Something about its crisp hand and white color made me think of summer. Make a shopping list for the other items and notions you'll need. Back in your work space, take your bias tape and start pinning it to your dress form. Play around with the tape until you're satisfied that its position faithfully represents the design of your sketch. Pin a big piece of your muslin to your dress form. Make sure it lies on grain — pin the center front first, right down the middle of the cloth. Then pull the muslin until it lays smoothly over the form, and start pinning it along the line of the bias tape beneath. For the front, you really only need to work on one side — we will fold the muslin and transfer all the pattern markings, mirror-image style, later. Pin the muslin around where you want the arm hole to lie. Pinch out the fullness in the fabric, smoothing the surrounding muslin, and pin into position the front dart. Now you can start cutting out the actual muslin. Leave a generous 2"-3" around the neck and arm holes, and slash as pictured to allow the muslin to lie smoothly around the dress form. Once you have the front pinned and smoothed to your satisfaction, move to the back. Repeat the process — start with a big piece of muslin, pin it to the form on the fabric grain, and then start pinning onto the lines of the bias tape. Cut and slash once you are satisfied. Cut out two generous semi-circles of muslin and pin them onto the shoulders of the dress form to start drafting the sleeves. Once you have every muslin pattern piece pinned and smoothed, start transferring the lines of the style tape to the muslin using the pencil. Basically, this just means playing connect-the-dots with the pin heads. To mark the dart, draw a series of slashes over the top of the dart as shown. When you unpin the muslin from the form and untuck the dart, the negative space between the slash marks will thus reveal the depth and position of the dart. Trim the draft pattern pieces to a 1" seam allowance (or more). Now, it's time to baste the muslin pattern together with your machine, and try it on for size. It might aid you to take a few self-taken snapshots in a mirror so you can check the fit, especially in the back. If there are any areas where the fabric is pulling strangely across your body, or hanging loose, that's a sign that your muslin needs adjusting. Seam-rip and re-baste the seams as necessary. My muslin was a little too tight in the hips, making the dress bunch at the waist, so I narrowed the seams there. Then it hung smoothly. Wherever the fit isn't perfect, adjust it. And, as you can see, I had to do a bit of finessing on the shoulder and armscye. As Yohji Yamamoto once wrote, "The shapes of the human shoulder are as numerous as the types of faces." Getting the shoulder just right is tricky — I had to move the top of the armscye out towards the shoulder and raise the bottom of the armscye because it gaped — but worth it. Returning the muslin to the dress form gives you some perspective on your work and makes it easier to do adjustments of this nature. Remember, most clothing hangs from the shoulders. These changes can be kind of tedious, but necessary. This attention to fit is what will elevate your self-drafted pattern above a standardized commercial pattern. Once the shoulder is corrected, check the side seams. I'm moving mine a little bit forward, as you can see, because the front pattern piece was wrapping around a little too far towards the back of the garment. You want side seams that go straight down the sides of your garment, like plumb lines. Now, make pencil markings for things like the the edges of the cap sleeves, and the end point of the back zipper. Finally, take the perfected muslin off the mannequin and cut it along the seam lines, as shown. Here is my completed pattern. The muslin itself is now the pattern. It is corrected and perfected. It has all markings for zipper, dart, and sleeve placement. It fits well, even in the shoulders. It is marked with grain lines, the names of each pattern piece, and a reminder that this pattern has no seam allowances. Your custom drafted pattern is finished! Now's as good a time as any to iron it. This is not a sewing tutorial. (Although we have published a couple detailed, step-by-step sewing tutorials around these parts if you are in need of one.) So I won't be going into tremendous detail about the cutting or sewing of the actual dress. If you're reading this DIY, you're probably a fairly seasoned home sewer. So just pin and cut out your new pattern in your normal way. And sew your dress in your normal way. I finished my dress just in time to wear it to the Council of Fashion Designers of America awards, which took place this past Monday. I had a great time — I talked to John Waters and met Joseph Altuzarra's mom — and kicked off my high heels, the better to dance. Because wearing a white dress is tempting fate, someone spilled red wine on me at the after-party. (Because I am not Joan Didion, the spiller was not Roman Polanski.) I ended the night in my kitchen a little after 3 a.m., scrubbing the stain out with Shout, Comet, and a toothbrush. My dress may be less than a week old, but it has been thoroughly christened. Here's one last view of the completed dress. Go forth and draft!